But I had a problem! I tried a recipe entitled “10 Minute Mascarpone” and didn’t read it through until the day I needed it. Turns out it was 10 minutes PLUS an overnight straining! Bummed, I made a “Mock Mascarpone” filling for the cake; it was very good, actually a great substitute but wasn’t quite the real thing. It turns out that it really does take about 10 minutes actual work to make Homemade Mascarpone Cheese, and it is pretty incredible and well worth the wait…just plan ahead. It’s super creamy, rich and decadent and better than any Mascarpone, however pricey (and it can be expensive) I’d ever had, from the store or from an Italian shop. Maybe because the Homemade Mascarpone is so fresh. It was molto delizioso. 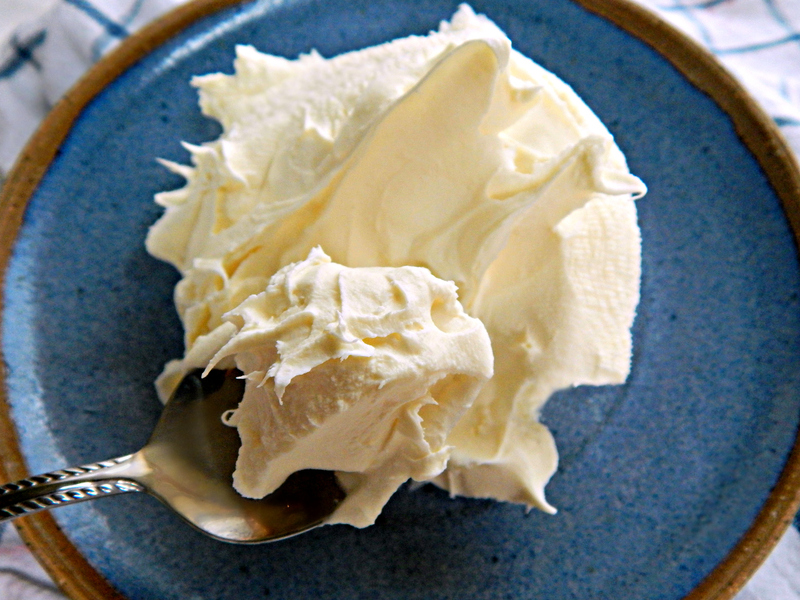 If you’re not familiar with Mascarpone, think along the lines of cream cheese, only better. A little softer, a lot richer and absolutely decadent with just a bit of a faint tang – but not as much as say, cream cheese. As a matter of fact, if you’ve ever had Tiramisu or a sweet Calzone, you’ve probably had Mascarpone. Now, what do you do with this bounty of creamy, dreamy goodness!? Just like cream cheese, Mascarpone can go sweet or savory…but however you use it, make sure you make the most of it and use it fast. Soft cheese like this has a very short life and needs to be used pretty quickly. I’ve used my Homemade Mascarpone Cheese in a couple of recipes on my site, but my hands down favorite are these Cream Puffs with Mascarpone and Blueberry Compote or maybe my Epic Pear Almond Granola French Toast. Follow the link at the bottom of the post for more recipes using mascarpone. I went with a straightforward method using whipping cream and lemon. All you need to do is heat and hold the cream for a few minutes and add the lemon. Hold again for a few minutes, then let cool to room temperature and strain overnight. So yes, it was about 10 minutes of actual work but you do need to be at the stove for the cooking and around to let it cool to room temperature and start the straining process. My Homemade Mascarpone Cheese using this method was beautiful, rich and creamy. Next time, I might try a method using Cream of Tarter, which I always have on hand for meringues but don’t often use. If you’d like to expand and try other methods than this, check out this very handy pdf from Dennis W. Viau. A “purist” may argue that true Mascarpone (it is recognized as a traditional regional food product) needs to be made with cream and the must of grapes during harvest, or from the tartaric acid removed from the bottoms and sides of wine barrels. Me, I’m not a purist, and while I’d love to taste that Mascarpone, I’m more interested in really great food I can actually pull off. If you are a purist, you might find this 42-page pdf on Mastering Mascarpone interesting! The cost of your Homemade Mascarpone Cheese is going to be dependent on the price of your cream. I love picking my cream up at Aldi or Cosco (the prices are usually the same but at Costco you’re limited to a bigger container) where it runs about $1.99 a pint. If you don’t have access to either, look for cream to be on sale around any holiday. Cream keeps for several weeks in the fridge. Don’t buy ultra-pasteurized cream if you can help it. It’s not always labeled but usually has the plastic spout. I’ve tried it and the Homemade Mascarpone Cheese takes longer to set up and is much thinner than that made with the regularly pasteurized cream. There’s a picture of the Homemade Mascarpone Cheese in the strainer made with the ultra-pasteurized cream – it’s the flatter, less thick Mascarpone Cheese. And also I have the original picture with the regularly pasteurized cream in the strainer. Noticeably thicker and far more clotted. First of all, make sure all your equipment, especially the strainer is super clean. It’s best to sterilize the strainer and spatula you’ll be using. Have a thermometer ready and very clean. For straining, use 3 layers of cheesecloth, a large coffee filter or sterilized cloth. In a medium saucepan, stirring now and then, slowly bring the cream up to 180 degrees F. and hold it for three minutes, at the 180 mark or as close as you can get. Add in the lemon juice (and salt, if using) and continue to hold at 180 degrees F, stirring now and then for about three minutes. The mixture should coat the back of a spoon. Remove from heat and let cool for about 30 minutes or until room temperature. Set up a small strainer over a larger bowl. Line with cloth, several layers of cheesecloth or a coffee filter. Pour mixture into strainer. Place into the fridge, lightly covered and leave overnight (or approximately that amount of time) until cheese has reached desired consistency. If needed, give the cheese a turn so the center drains properly and return to fridge. Do not discard any liquid in the bowl yet. You will likely find the cheese in the strainer to be a bit thicker and denser around the edges and more liquidy in the center. Gently blend together. If the mascarpone is still too thin, turn it over in the cheesecloth and drain a bit more. If too thick, add a little bit of the liquid back in. Store in the fridge, tightly covered and use in 1 to 3 days. Note: larger batches work just as well, but you’ll find that they strain a little more unevenly. You may wish to divide the mixture among smaller strainers or, in the morning, give the mixture a turn and leave it to strain longer to the desired consistency. Update: I’m happy to report that this Mascarpone was one of the Features from Fiesta Friday!! This entry was posted in Click here for Fabulous Food Posts and tagged Cream, Italian, Lemon, Mascarpone. Bookmark the permalink. What a great discovery for me! Home made mascarpone looks awesome. Thanks for sharing! Sandhya, I couldn’t believe how good and how easy! I know now to plan ahead but I have already made it again! Who knew it could be so easy to make mascarpone? Blown away! Oh my this is awesome! I didn’t even know you could make homemade mascarpone :O I love mascarpone. I use it in any recipe that requires cream cheese 😀 Saved for later! Hand me a spoon, ’cause I want to dig right in! Thanks for joining Fiesta Friday! Oh, and I just hate it when I forget to read the recipe through and get a surprise at the last minute. It seems like you recovered from it though. Great job! I always get a little anxious or nervous, call it what you will, when I make something that seems like a bit of a leap (and whenever I make pie crust, lol!) – But this was so easy and so gorgeous — I seriously want to make it all the time, now!! This is a great idea – one I will come back to for sure. And thanks for the links. Juhls, it was so easy and so good!! And really so much better than anything I could buy here in the States!! Oh wow! I simply cannot make this…I would literally eat the whole lot in one go!!! Elaine, I found myself walking past the fridge and taking little tastes of it, lol!! It IS so dangerous and so rich!! Ha ha! There’s my proof!! Wow Mollie this Mascarpone looks so creamy and delicious! Julie, this recipe actually opens up a whole new realm of cooking for me – seriously good and it’s really pretty inexpensive to make it! Your recipes have just gotten amazing Mollie. I need a Mollie board on Pinterest! Thanks, Julie!! 🙂 That made my day!! I have been toying with the idea of making some cheese, but have shied away. This certainly sounds easy enough though! I had no idea that’s how you make mascarpone! Where I come from, we make something resembling cottage cheese using exactly this process, but with milk. This is going to be my weekend project now 😀 Thank you! I’ve made cottage cheese, too. It was quite a bit more work as I recall! Really? That’s interesting bc mine’s exactly this process! Maybe it was because it was a larger amount, the pans were bigger – I think I had to pull out my largest one, lol! The cottage cheese had to be cut too, as I recall, and then rinsed and squeezed. Wow the cheese looks dreamy! I just loved making it – and it was super easy…of course, I don’t like the waiting part, lol!! That’s good to know!! I just keep tasting and using it; been five days now and I haven’t died, lol!! I think that a lot of soft cheeses can carry some pretty bad bacteria so people like to be conservative! I don’t know why I haven’t made Mascarpone before, but I’ll be making it a lot from now on! Just for you, sweetie, I’ll put a big fat F on it!! 🙂 Haha, I just realized I’m an “international blogger!!) lol!! My most challenging recipe instruction is being told to boil a sugar syrup until it reaches the one thread or two thread point.